Fiction – Kindle edition; Hodder; 544 pages; 2012. 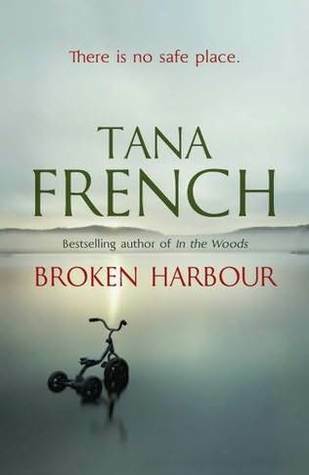 Last week Tana French‘s Broken Harbour won the Crime Fiction Book of the Year at the Irish Book Awards. I read it back in July, within a week or two of its release, after I’d trawled every independent book store near Charing Cross Road looking for it. Not one shop had it in stock and I had to resort to buying it from Amazon as a Kindle edition. I have a long relationship with Tana French, having read (and loved) In The Woods, The Likeness and Faithful Place. And because I knew this one was set in the aftermath of Ireland going bust — a topic that’s only now just emerging as a common thread in Irish fiction — I was eager to read it, hence my search for it on foot (and then online). The story is essentially a locked room murder mystery: a young man, Patrick Spain, has been stabbed to death in the family home; his two children have been smothered in their beds; and a fourth victim, Jennifer Spain, is in intensive care but is not expected to recover. There are no signs of forced entry. However, something is clearly not right. As Scorcher’s investigation develops he discovers some strange things about the Spain family, specifically Patrick, who was made redundant from his well-paid job and then spent countless hours on the internet trying to find out what was making a noise in the interior walls of his house. Was he paranoid — or depressed? Or was there really something living in his house he couldn’t catch? nowhere, stark against the stars” gives the house an eerie setting. The fact that “Scorcher” has bad memories of the area from his childhood, when it was known as Broken Harbour, adds to the claustrophobic feel. The place reverberates with menace and French mines that trench expertly. She is also an expert at characterisation — and boy, there is an extensive list of well-rounded characters in this one: Patrick and Jennifer Spain, Jennifer’s sister Fiona Rafferty, rookie cop Richie and Scorcher’s troubled younger sister, Dina. Scorcher, of course, is the standout — he’s appeared in French’s earlier novels, but is the least likable of all the police she has previously introduced us to. He narrates Broken Harbour in a voice that is full of bravado and egotism, a voice that I found annoying pretty much from the start. I am bloody good at my job. I still believe that. I’ve been on the Murder Squad for ten years, and for seven of those, ever since I found my feet, I’ve had the highest solve rate in the place. But Scorcher has a softer, more humble side, and as you get to know him over the course of the book it becomes clear that his arrogance is a cover for deep, personal insecurities. He’s actually a damn nice bloke with his heart in the right place — once you understand that, you really want him to figure out “whodunnit” so that he can maintain his impressive “solve rate”. But, of course, there are some downsides to this novel, too. Broken Harbour is big, rollicking, often repetitive and sometimes unwieldy. It could have lost a good 200 pages and been all the better for it. There are too many divergent threads, too many red herrings and too many sub-plots going on. This means it takes an age to get to the conclusion — and when you get there you’re so exhausted (or bored or confused) it doesn’t feel particularly satisfying. That’s not to say this is a bad book. It’s not. I enjoyed it and doubtless plenty of others will, too. Aside from French’s tendency to overwrite things, this is a suspenseful murder mystery that breaks normal crime novel conventions — this is more about why the crime happened and less about who committed it. It also has a kind of Scandinavian feel to it, by which I mean it puts the abhorrent crime into a social context: what part did the rampant consumerism and the subsequent credit crunch have to play in the deaths of one man and his two young children? In a way, you could probably say they had been broke even before Patrick lost his job. He had made good money, but their credit card had a six-grand limit and it had spent most of the time maxed out — there were a lot of three-figure charges to Brown Thomas, Debenhams, a few websites with vaguely familiar girly names — and then there were the two car loans and the mortgage. But only innocents think broke is made of how much you earn and how much you owe. Ask any economist: broke is made of how you feel. The credit crunch didn’t happen because people woke up any poorer than they’d been the day before; it happened because people woke up scared. Back in January, when Jenny had spent two hundred and seventy euros on some website called Shoe 2 You, the Spains had been doing just fine. By July, they had been broke as all hell. Some people get hit by a tidal wave, dig in their nails and hold on; they stay focused on the positive, keep visualising the way through till it opens up in front of them. Some lose hold. Broke can lead people to places they would never have imagined. It can nudge a law-abiding citizen onto that blurred crumbling edge where a dozen kinds of crime feel like they’re only an arm’s reach away. It can scour away at a lifetime of mild, peaceful decency until all that’s left is teeth and claws and terror. You could almost catch the stench of fear, dank as rotting seaweed, coming up from the dark space at the back of the closet where the Spains had kept their monsters locked down. That is a long quote to finish on, but I think it showcases French’s prose style and her understanding of what makes people — and society — tick. It also represents the heart and soul of this quite ambitious but slightly flawed novel. For other, more positive takes on Broken Harbour, please see Guy Savage’s review at His Futile Preoccupations and Danielle’s review at A Work in Progress. Thank you for the review. I will be reading French as soon as I get the books, I ordered all. Your analyses reminds me of another mystery author, Elizabeth George. You may be familiar with her books. I love her novels. In her recent books she, too, started developing long narratives with a large cast of characters and subplots that somehow take away from the thrill of following the main plot. You reach the last page exhausted. I think I have a theory. These writers have a knack of how to imagine characters and they are good, hence the tendency to crowd the narrative. Each character, even peripheral, wants to be heard, wants center stage. Some writers have difficulties coming up with characters well developed, and some others don’t know how to contain the invasion. Just my 2 cents theory. I liked the audio version a lot, but like some others we were left a bit puzzled at the end. I like your theory, Doina. I haven’t read any Elizabeth George but she does sound a little similar to Tana French in the sense of having so many characters all vying for attention. Hi Diane, French has a tendency to leave her endings very open — this is something I quite like because it’s up to you to figure it out; there’s no right or wrong answer. Lots of people hated her first book for that very reason — the crime isn’t solved, but that’s what I liked most about it! I loved her first 2 novels and am hoping to read Faithful Place before this one. There’s an immediacy to her storytelling which seems unique amongst the current crop of thrillers.